It’s amazing what you can buy here in Texas! It’s still possible to purchase affordable homes for sale in Harker Heights, Killeen, and neighboring communities, houses you’d be proud to make your own. Whether you’re buying a house with cash, or you’re a first-time buyer, we’re here to help the entire transaction go smoothly, from start to finish. If you’re selling property in this region, reach out to us as well; we’d love to talk with you and bring you interested, qualified buyers. 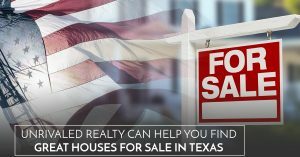 For all your Texas real estate needs, turn to the specialists at the Unrivaled Realty Group today!